Sometimes your cooking skills just don’t cut the mustard. Perhaps you’re trying to impress your date with a dinner at home and spag bol is the extent of your menu, or you’ve just had a really busy day at work and can’t be stuffed. No need to worry about the lack of takeouts, we’ve scoured the scene and found the best takeaways in Auckland to keep you well fed and ya belly full. There’s nothing like a bitta’ fush and chups on the beach to classify as a classic Kiwi takeout. FishSmith in Herne Bay is a fancy option to your usual fish and chip offering. With fish tacos, the best salted fries you’ll ever try, and crumbed haloumi, this is one joint we’ll be returning to. Takeaways doesn’t mean unhealthy. You know those days when it’s mid-week and you shouldn’t really be reaching for the burgers and fries yet? This is where Food Truck Garage comes into play. With a ‘healthy’ take on burgers and fries, delicious salads and even fro-yo’s for dessert. There’ll be no guilt-eating around here! If you're looking for takeaways in Auckland, then turn to Fatima’s! You’ve all heard the ad on the radio, and there’s no denying we’ve been guilty of repeating the line out loud when thinking what to get for take-out. Fatima’s is def one of our faves—you can’t go past the catch of the day with some potato koftas on the side. For chicken and salads at a good price, Bird On A Wire is the place to go. Taking the fuss out of eating, there’s no waiting around, with the chook already shredded and the salads made freshly that morning. 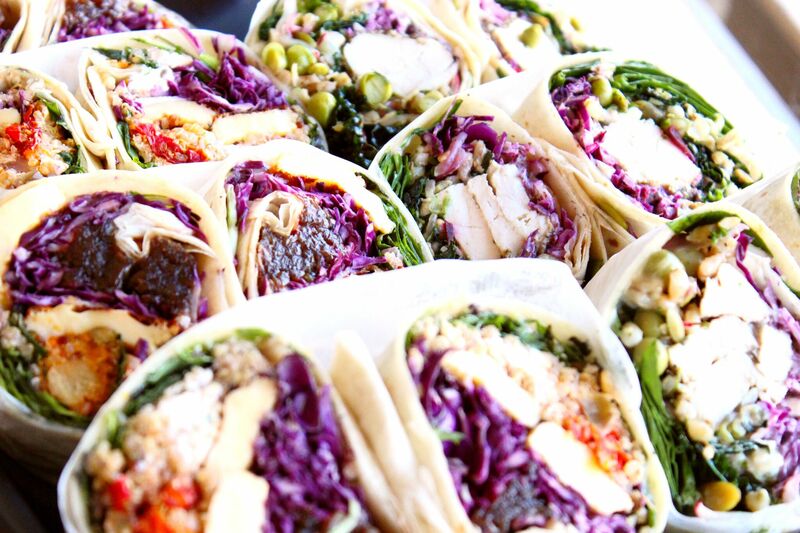 Visit Bird On A Wire in Ponsonby or Takapuna for your fast fix. What started in Jess’ wee kitchen in her Ponsonby abode has now evolved into stand-alone stores in Herne Bay and Remuera. Jess’ Underground Kitchen serves up the best homemade meals, so you can pretend to your date that you really do have cooking skills. The menu changes weekly and you can find out what’s on offer each night on their website. 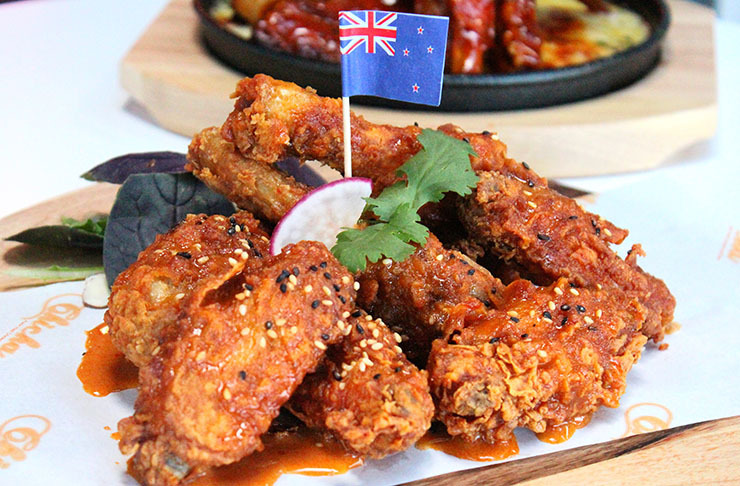 This humble spot in Kingsland sure knows how to serve up a Korean junk food feast. Chicka know how to take fried chicken to the next level with their marinades and side dishes. Why just have a regular piece of fried drumstick when you can have one coated in honey garlic sauce or sweet and spicy gochujang? Their side dishes are also just as tasty, our fave would have to be the corn cheesy. Sweetcorn, edamame, red onion, carrot and parsley just drenched in ooey-gooey melted cheese, you really can’t go wrong with this dish! The saying goes, always go to a restaurant that is full, as it shows its value. 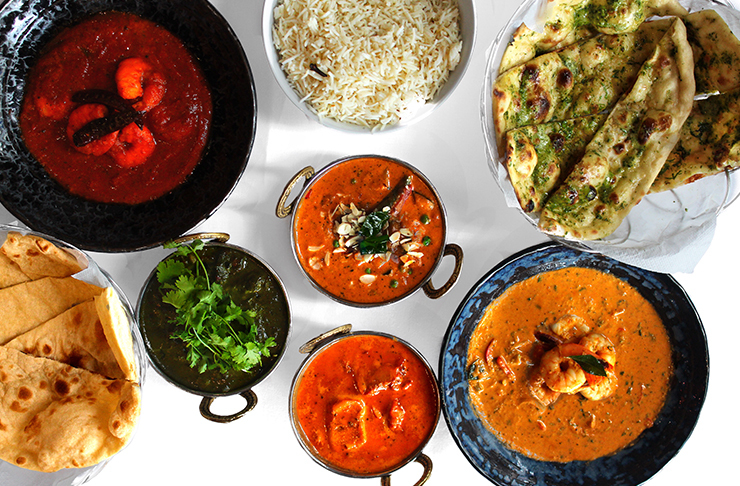 Paying homage to one of the best take-out Indian food in Auckland, Paradise does it just right. The Sandringham Road joint has not-to-be-missed signature dishes including rice biryani, butter chicken, onion pakora and chicken madras. It’s also open til 10pm for those late-night eaters. Renowned for serving the best bowl of authentic Malaysian laksa in town, there is always a line at Newmarket gem, Selera. Luckily for us, they do takeaways which means you don’t need to queue up in those long lines to get a taste of these bowls of creamy, spicy goodness. They also do a banging Hainanese chicken on rice with tender chicken that just melts off the bone and the most fragrant rice, which is not to be missed! Sometimes the worst part about getting takeout in Auckland is having to go and collect your meal. Where is free delivery when you need it?! America has it, and so should we. Soul Thai in Grey Lynn meets all our lazy Friday night needs, offering free delivery for the ‘burbs in the area. With no shortage in quality, Soul Thai serves up restaurant-worthy meals. We all love a good dumpling feast for a Saturday night in, and we’re not lying when we say Barilla Dumpling serves up some of the best dumplings in Auckland. Save your bucks for a night on the town, and splurge on 20 dumplings for only $14. For the best and freshest Japanese takeout, visit Ramen Takara. Infamous for its Ramen bowls, the popular Browns Bay spot is also open in Ponsonby, so city slickers don’t have to venture too far. The noodles and broth are made on site every day, with all dishes cooked with ingredients sourced from local suppliers. Talk about quality! What is life without being able to get your beloved Italian meal to eat in the comfort of your own home, splayed out on the couch while enjoying a glass of vino? Thankfully, you don’t have to worry about that. The infamous spot on Ponsonby Road that is Prego, offers a full takeaway menu, so you don’t have to stress over what to wear on those evenings you can’t be bothered. The takeaway menu offers a range of pizzas, pastas and our favourite—the ciabatta loaf. A long-time favourite for Parnell residents, the owners of Kopio broke the hearts of many when they closed their doors in 2012 to retire. Much to our delight, the owners decided they were to young to stop work, and re-opened this year! Serving up delicious Malaysian meals, make this a pit stop en route to your couch, as they offer a takeaway menu too. You may have seen a questionable orange container with sounds of sizzling oil and long lines of people near the Auckland City Library. That is the home of Kai Eatery, a.k.a., home of the best kumara fries in town, an epic-sized fried chicken fillet and tasty steamed buns. 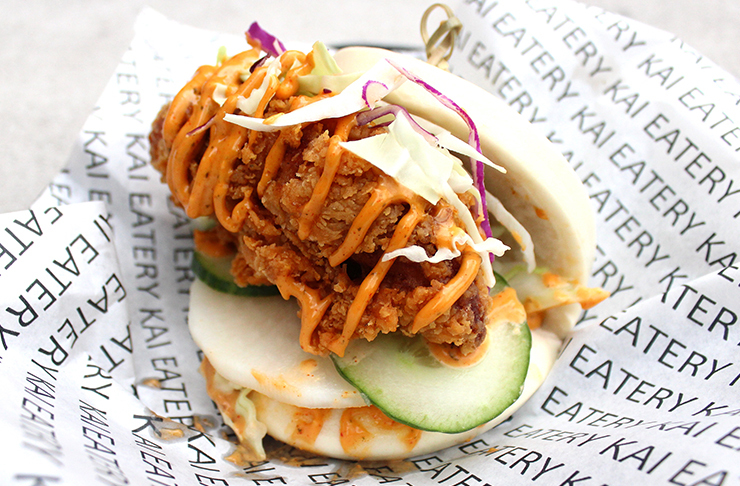 For its bomb tasting flavours and modest price, Kai Eatery has become a heavy favourite amongst Auckland students as they get a feed from Kai to-go and make their way to the library. If you live near the ‘burbs of Sandringham then no doubt you’ve been to 7 Siri Taste Of Sri Lanka, and if you haven’t you’re sorely missing out. We love that it won’t break the bank either, with main meals sitting at $15 and must-have curry puffs at only $1 each! 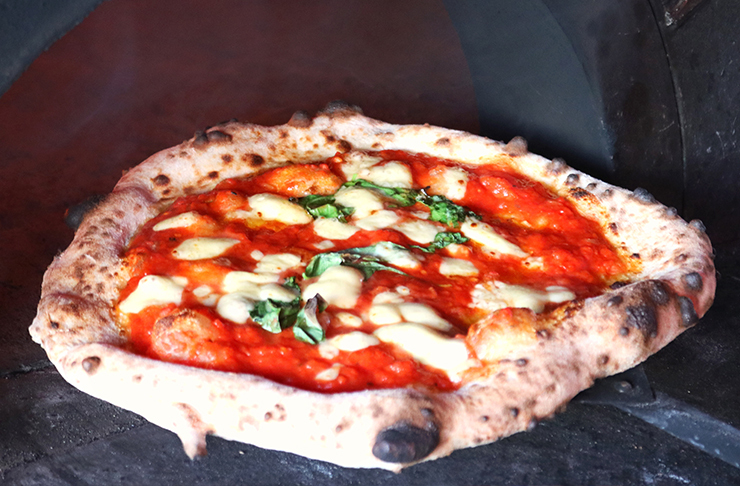 Elevate your pizza at home experience with a sourdough base wood-fired oven pizza from UMU in Kingsland. With a simple and straight-forward menu with only eight different flavours of pizza, these guys don’t fool around and prove the good old saying—less is more. They also do weekly specials and, if you’re lucky, you’ll be able to get your hands on their Nutella pizza which is just too good for words. This long-standing Indian restaurant has been around for 21 years, so when you know order a meal there, you know it’s going to be good. Sometimes you just need a curry to warm the tummy, and Oh Calcutta is going to hit the spot, serving up some of the best takeaway food in Auckland. Keep the party going when you order a couple of metre-long pizzas from the infamous Toto’s Pizza. If you can’t decide on what flavour to get, never fear as you can divide two flavours by 50/50. We can’t steer away from a delicious burger on a night in, and Burger Burger sure does satisfy the cravings. We can’t look past the 12-hour braised and rolled first-class lamb shoulder burger. And it’d be rude not to order a side of charred broccoli and potato skins. If you don’t order takeaway at Eden Noodles you’ll run the risk of waiting in a long queue. Most popular for its dumplings—and adverse to fussy eaters—there’s only one flavour, pork. While you obviously need to order said dumplings, we do suggest branching out to try some of the fresh noodles and wontons on offer. If you’re gonna eat a pizza, it better be good. When you pay a visit to Farina you know it’s going to be delizioso! This Italian-owned joint serves up a full menu of traditional Italian dishes so you can recreate your very own wine and pasta night with your loved one at home. Spaghetti sharing, anyone? Free delivery you say? Yes, that’s right! Those of you lucky enough to live in Penrose, Ellerslie, One Tree Hill, Onehunga and Greenlane can gobble up a delicious meal without the guilt of being too lazy to pick it up. Not one to shy away from premium produce, Big Fish Eatery makes its mission to serve delicious yet affordable Pan Asian cuisine. 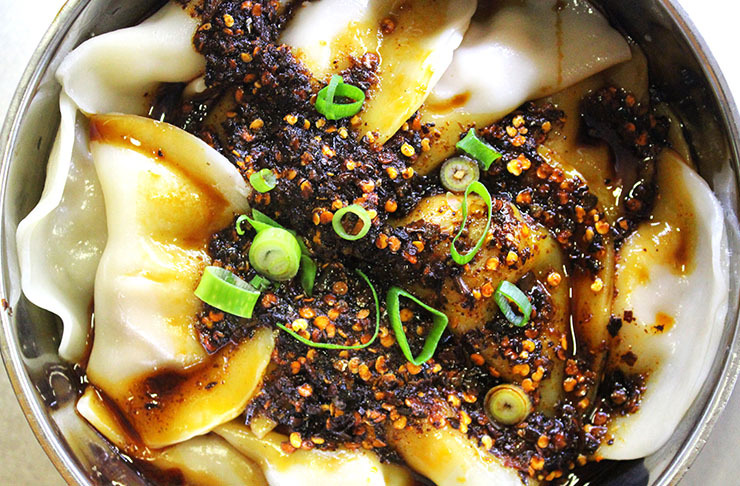 Noodle lovers unite: Shaolin Kung Fu Noodle has a rep for being the best in the biz. This quirky eatery will surprise you with its traditional Chinese food menu, boasting more than 50 dishes on offer! 50 you say? Yep, that’s right, and to reassure you quality is not lost, all noodles are made by hand. Even though you’re not going to actually dine in at Kiss Kiss, don’t forget to take a mandatory pic for your ‘gram, cause the atmosphere is awesome. This Thai-infused restaurant serves up flavoursome meals that will have your taste buds zinging. The snacks are not to be missed, with pork crackling and sriracha popcorn on offer. Along with shared plates, you can slurp on a noodle dish or test your chopstick skills with rice for a main. Opting for takeaways at KK Malaysian is always a good idea, small in size and always full, you know you’ll be waiting a while if you choose to dine in. The chicken laska is an all-time favourite, but we suggest trying a few different dishes—‘cause they’re all so darn good! This one’s considered a bit of a hidden treasure, as a favourite for K Road locals. If you can’t go past a good Thai takeaway then Pok Pok will have you satisfied. Serving up some of the best Thai in Auckland, the chefs know what they’re doing when it comes to quality food. The best part is, you don’t even have to leave your doorstep! Pok Pok also does deliveries—hallelujah! Cheap, cheerful and jam-packed full of flavour—that's Big J's summed up for ya! As the name suggests, these burgers aren't for the faint-hearted. Have a go getting your gob around one of the specialties such as the "Steak a Naise" with char-grilled marinated steak, sautéed onions, streaky bacon, Swiss cheese, crispy seasoned potato wedges smothered in some heavenly Bearnaise sauce. Yummm. Popular amongst Parnell locals, Moto Sushi Bar is your go-to spot for fresh, healthy and authentic Japanese cuisine. Perched down the cutest set of wooden stairs, this tiny restaurant is easy to miss but you'll regret it if you do! Filled with regulars when inside, we recommend grabbing a bento box (or three!) to take away and head down to the waterfront for a picnic. Home-cooked cuisine doesn’t actually need to be prepared in the kitchen of your own home when you have Boy & Bird’s takeaway menu of heart-warming roasts. From roast chicken, mash, gravy and salads, Boy & Bird could fool anyone to think that you spent hours of your time making a homely feast. Open till the late hours of the night, Frasers has created a name for themselves as being the go-to place for late night desserts. The popularity of Frasers can sometimes get a little overwhelming as this eatery gets absolutely packed during weekend nights. They do some of the best New York-style baked cheesecake this town has to offer and Mt. Eden locals are constantly fighting to get a slice. Next time, don’t wait for a table and get it to go and enjoy this slice of heaven on the top of Mt. Eden. Cake with a view, can we ask for anything more?